Did Ariana Grande Copy ‘7 Rings’? But did she actually do anything wrong? Illustration: Mike McQuade and Photos by Kevin Winter/Getty Images, Joseph Okpako/WireImage and Ethan Miller/Getty Images. Allegations of copying and cultural appropriation are hardly new to popular music, but today, it can feel like nearly every big hit becomes a target. Social media fuels the rush to litigate whether familiar riffs and rhythms are exclusive or communal property — debates that are fueled by a history of racial injustice in the music industry. At a time when the language of pop is as referential, intertextual, and, sure, derivative as ever, teasing out the lines of influence has become a prominent part of public conversations among artists and fans. So when Ariana Grande’s “7 Rings” began climbing the charts with a rhythmic cadence that reminded a lot of people of a lot of other songs, it quickly became a platform for discussions of what we deem original and what we hold as communal. Princess Nokia was the first to call Grande out, tweeting that it “sounds about white” that the artist copied her flow from “Mine” (2017). Then, the pile-on began. Soulja Boy called Grande an outright thief on Twitter for copying his song,“Pretty Boy Swag” (2010). And 2 Chainz’s fans noted similarities between “7 Rings” and the rapper’s “Spend It” (2011). Rodgers and Hammerstein have writing credits for “7 Rings.” (In fact, the company that owns their catalogue controls 90 percent of the songwriting royalties.) Princess Nokia, Soulja Boy, and 2 Chainz do not. But should they? A closer examination complicates a rush to judgment. Like the B section of “7 Rings,” the chorus of “Pretty Boy Swag” lands its lyrics directly on the downbeats, often with a second syllable quickly following — compare, “pretty” to “want it” or “got it.” While Soulja Boy only occasionally employs this rhythmic device, Grande does it on almost every other beat — a small distinction, but one that, technically, differentiates the two songs. As for 2 Chainz’s “Spend It,” the song features the same downbeat-based cadence, and his lyrics present additional parallels — he says “I’ll spend it” where Grande sings “I got it” and “just bought it.” But, crucially, he uses a slightly different rhythm than Soulja Boy and Grande, evenly dividing the beat rather than following a short note with a long one. While it’s possible that one or all of these songs could have been a model for “7 Rings,” taken together, the claims start to undermine each other, suggesting a broader stylistic trend is at play. If a copyright infringement case were to proceed from any of these allegations, an expert witness would likely argue that the rhythms in question are so generic as to be unprotectable. They not only echo each other, they also resemble countless recent recordings that all employ the Scotch Snap — a bouncy, emphatic rhythm in which a short note on a strong beat is followed by a longer note on a weak one. It has been in use, and at times in vogue, since at least the 17th century. And recently, it’s become one of the most prominent rhythmic approaches in rap (and hence, pop and R&B). But the longer history of the Scotch Snap should not obscure the innovative role played by 21st century rappers, who have shaped it into one of today’s most popular flows. In particular, credit is due to Lil Reese, Chief Keef, and other Chicago “drill” rappers for developing and popularizing the Scotch Snap approach into what it is today — a deliberate, insistent attack, with a dead-eyed sense of control. Just think of the stuttered flow that runs through Keef and Reese’s 2012 hit, “I Don’t Like.” Lil Reese didn’t pull Scotch Snaps out of thin air — Soulja Boy’s “Pretty Boy Swag” came two years earlier — but he did an inventive, influential thing by employing them as an almost unwavering rhythmic cadence rather than an occasional flourish. (Notably, Q-Tip did the same thing on A Tribe Called Quest’s “Start It Up” way back in 1998, but it didn’t catch on.) An increasingly popular way to sound cool and deadly, Reese’s steady snaps are second only to Migos’ triplets as widely adopted resources for rappers of all stripes. Scotch Snaps soon turned up on the tongues of Drake, Rick Ross, Meek Mill, Nicki Minaj, Post Malone, Cardi B, Bad Bunny, and Migos, too, to name a few. Given how rap and R&B vocal styles have converged in the last decade, it’s not surprising that rapping singers (or at least their songwriters) would inject the Scotch Snap flow into big, bold hits: Recall the “money, money on my mind” in Rihanna’s “Pour It Up” (2012), or the “fatty, daddy” section of Beyoncé’s “Drunk in Love” (2013), or the opening bars of “Look at Me Now” (2011), in which Chris Brown rhymes “yellow model” with “yellow bottle,” snapping all the while. It’s also been absorbed in the conventions of global pop, adding a little rhythmic edge to the likes of Korean boy-band BTS’s “Fake Love” (2018). Of course, the undercurrent in the “7 Rings” discourse, and a lot of the conversations around song copying, is the question of appropriation. It is easy to hear “7 Rings” as yet another example of an artist profiting off her access to a mainstream market that still demands black music (especially when Grande dips into “blaccent”), but not necessarily by black people — despite sensational exceptions and steady progress. As of last month, “7 Rings” had topped the charts for the sixth time; it’s been streamed more than a billion times around the world. 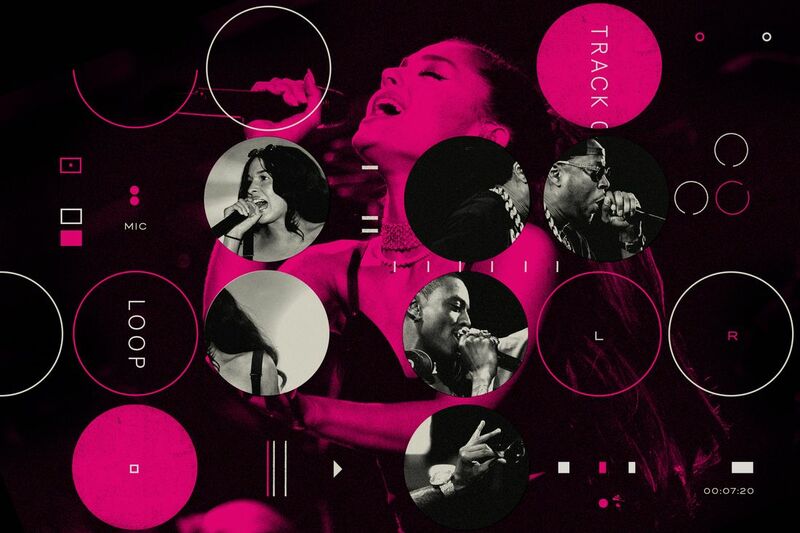 The fact that artists from “outside the circle” can still better exploit certain sounds developed by black artists and communities — and that there’s a long history of doing precisely that — is why Grande is being singled out for an otherwise unremarkable use of a widespread rhythm. “7 Rings” is less egregious than the deliberate or subconscious pilfering by white rock acts in the 1960s or ‘70s: say, the Beach Boys rewriting Chuck Berry’s “Sweet Little Sixteen” into “Surfin’ USA,” or George Harrison cribbing the melody for “My Sweet Lord” from Ronnie Mack’s “He’s So Fine.” But from another angle, the state of American pop is as insidious and parasitic as ever, and producers and songwriters are increasingly savvy about the borders of what is ownable, musically, and often set out to make the most subtly derivative versions of other hit songs they can.